Slack came from nowhere to be one of the leaders of the collaboration market in just two years. But being a leader means other people are keen to take a share of your business and team messenger application Flock is the latest to be eyeing up Slack's market. Today Flock is launching a development platform, FlockOS. It describes this as a chat operating system, that allows developers to build customized apps, bots and integrations. These can either be used within their own organizations, or published on the Flock Appstore, making them available for all Flock users. "Messaging and collaboration platforms have become the systems by which teams become more productive. Currently, most of our activities are collaborative in nature, and increasingly there will be the need for simple apps that are built on top of the messaging framework," says Bhavin Turakhia, CEO and founder of Flock. "Apps built on FlockOS empower teams to have more choices in the functionalities and capabilities of the collaboration platforms they use everyday. Instead of being 'stuck' with using a particular service and its limited capabilities, teams can now create a custom environment within Flock that is designed for their unique needs". FlockOS allows developers to offer a tightly integrated experience by using widgets. These include an attachment widget, sidebar widget, and modal widget -- all capable of displaying rich HTML. 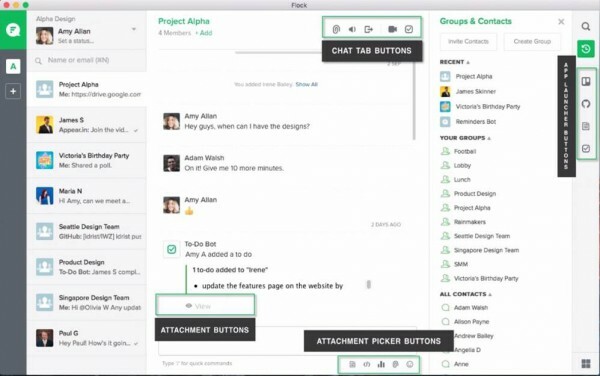 Messages and rich attachments can be sent to Flock users and groups. For example, an opinion poll in a rich attachment format can be broadcast to all in a group. It also shows real time updates on the poll results. Users can also add buttons to attachments to ensure apps are more discoverable, and in turn, boost app usage. Bots can be configured to send directed messages to users, carry on conversations and complete tasks from within Flock. FlockOS can also customize URL previews for specific URLs, so the app can display information relevant for the user. It’s designed to deliver a consistent experience across all platforms including web, desktop, and mobile without having to rework any code. You can find out more and see examples of existing apps on the Flock website.